Itâs said that Japanese farmers raising Wagyu cattle sing to them to make them happier â" and their succulent, fat-marbled beef even more delicious. Ask anyone who has eaten Wagyu beef prepared at the Sherwood Hotelâs Toscana grill and youâll hear them sing the praises of this tender but firm, full-bodied, rich beef with flavor that bursts in the mouth â" a beef-eating experience like no other. 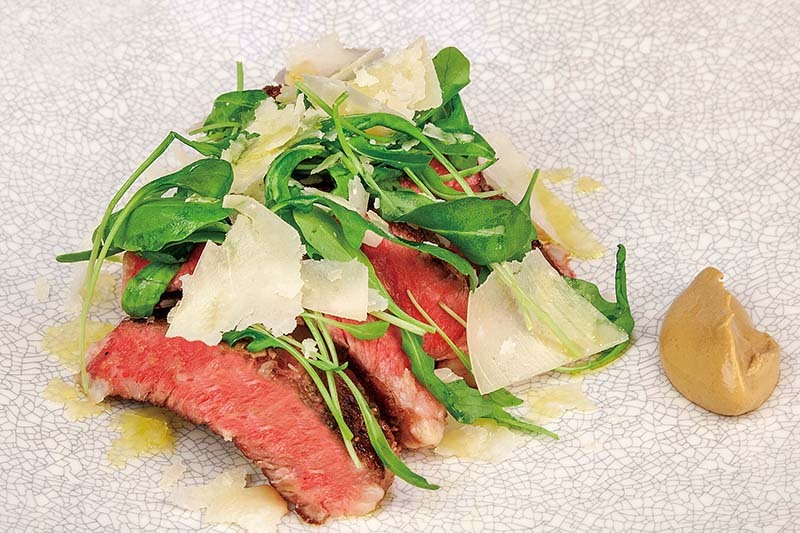 Wagyu beef is perhaps the biggest star on Toscanaâs new winter menu, but the restaurant is offering a series of new dishes that are all delicious and aimed to bring warmth to the cool winter months. Innovative takes on traditional dishes and ingredients are at the heart of the new menu. A typical Italian hors dâoeuvre of cheese and tomato ser ved with olive oil is given a local Taiwan flair with the addition of dried plums inserted into cherry tomatoes, a night-market snack that adds an Asian sweet-and-sour twist. The sliced green tomatoes are seasoned with fresh basil, contributing a grassiness to the dish. And instead of mozzarella, a creamy Burrata (made fresh by a cheesemaker trained in Italy and based in the classic Dadaocheng district of Taipei) is transformed into a foamy mousse that delicately integrates the creaminess of the cheese with the tartness of the tomatoes and dried plums. 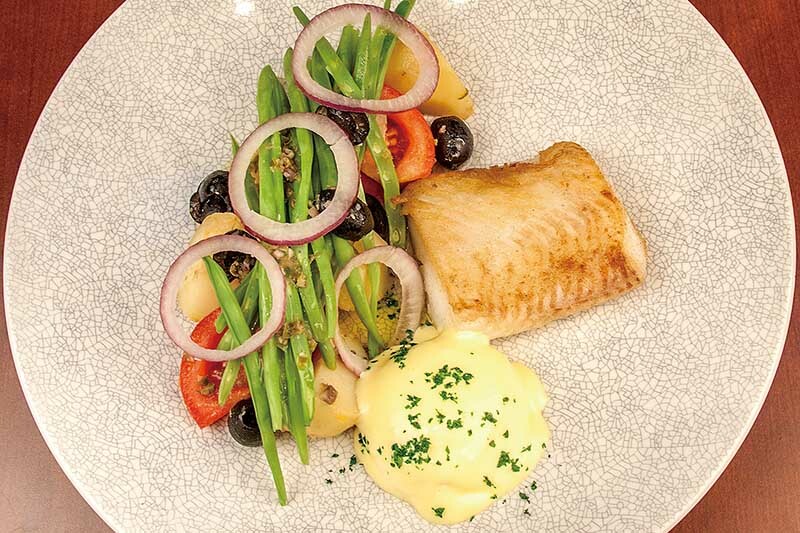 Another standout dish is the flaky, tender halibut steak from fish caught in northern Pacific waters. It is served beneath a creamy layer of tangy Hollandaise sauce, together with vine-ripened tomatoes grown in Yilan County and a rare variety of potato known for its firmness and sweetness. The dish comes complete with a tart dressing of olive oil with capers, lemon juice, olives, green grapes, and anchovies. All of the produce is grown right here in Taiwan and is served at the peak of freshness. At Toscana, USDA Prime rib-eye is served Tuscany style, with medium-rare slices under a bed of arugula, aged Parmesan cheese, and baked new potatoes, with spicy brown mustard on the side. The potatoes are cooked with rosemary and garlic, and the slightly bitter and spicy arugula cuts through the oil of the beef for a light and healthy dish. 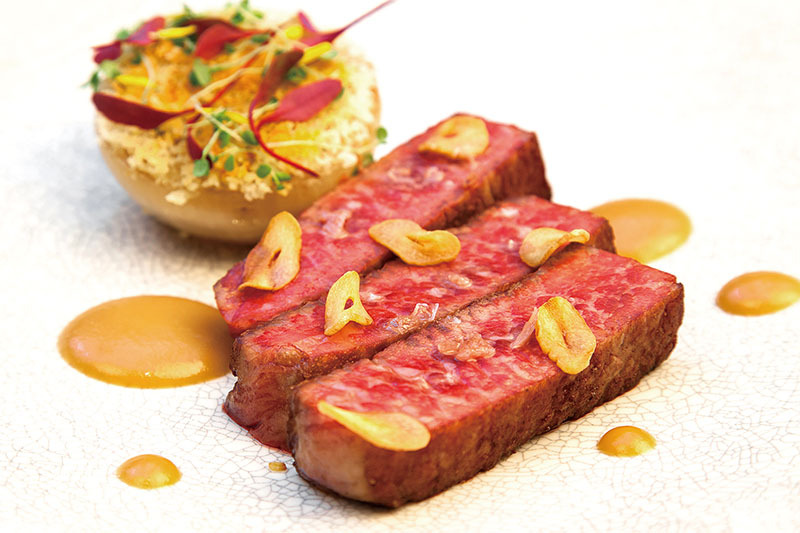 Authentic Japanese Wagyu beef only returned to the menu in October after a 14-year hiatus following concerns that Japanâs beef supply had been tainted by the emergence of bovine spongiform encephalopathy (BSE), more commonly known as âmad cow disease,â and Toscana has leapt at the chance to serve this much-prized beef to its diners. The Wag yu beef is served lightly seared but rare on the inside, the delicate marbling of fat glistening on the smooth pink surface, with dried roasted garlic chips scattered on the plate, dabs of red miso sauce, and a baked onion with truffle oil in herbs and lemon sauce. The meat is so tender that is seems to melt in your mouth, with the fat giving it an almost sweet flavor that permeates the taste buds. The savory side of the Toscanaâs new menu is well-represented, but Toscana has a sweet side as well, such as the truffle ice cream ball. Toscanaâs Executive Sous Chef Kevin Hsu learned this dish from the legendary Michelin-starred chef Umberto Bombana, owner of the legendary 8Â½ Otto e Mezzo Bombana in Hong Kong. Toscana offers this dish every season, but as truffles are a seasonal fungus, each season offers its own distinct flavor. The winter tr uffle is black inside and out and has the most concentrated aroma and taste, and consequently the highest price. 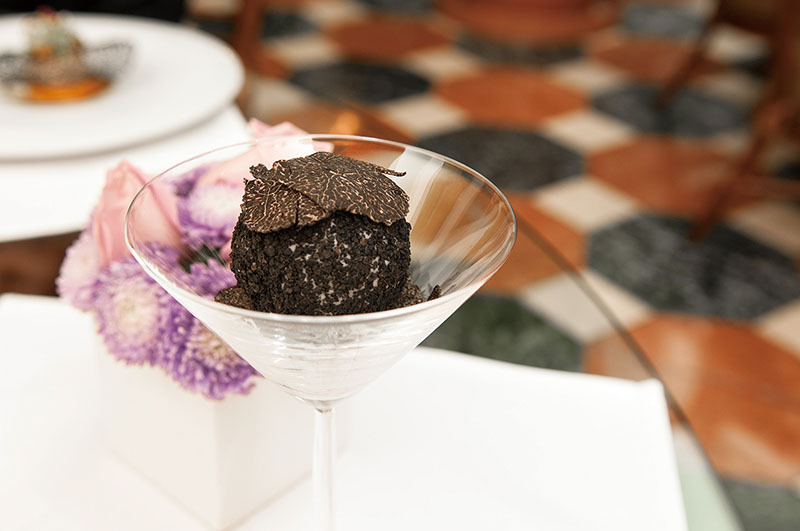 Imported from Italy, the truffles are pressed for their oil, to be mixed into the cream for the vanilla ice cream, along with a dusting of truffle crumbs across the top of the chocolate crust. The ice cream is a rich, velvety vanilla made with Mascarpone cheese that adds creaminess and a savory surprise to the sweet concoction. The whole dish is served within a thick, sweet chocolate crust. 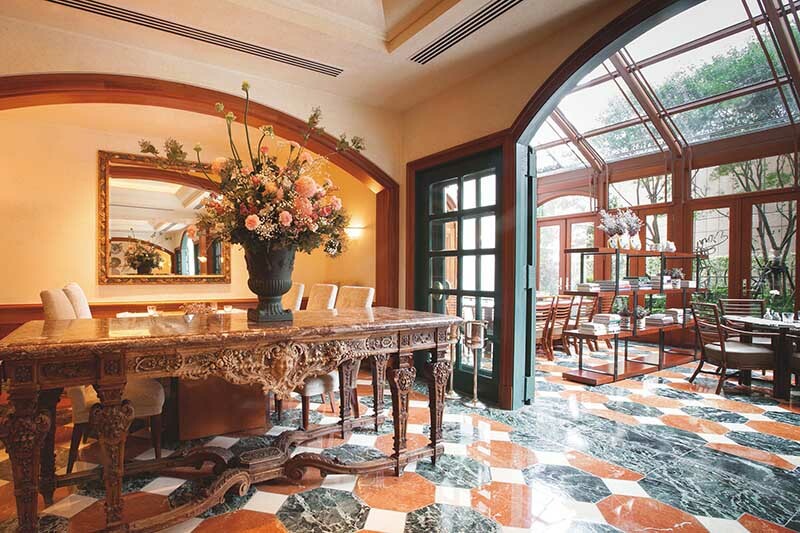 This winter the Toscana is the place to go to celebrate all special occasions!